The 2018 Mercedes AMG E63 S is wrought from the middle of your Venn diagram of desires. You want a car with power and personality; you need a car that can carry kids and cargo. You want a 600 horsepower hot rod; you need safety and subtly. You like wagons, because you have good taste and are smart. Well strap yourselves in—kids and groceries and all—and hang the hell on. Fast station wagons are quintessentially Jalopnik because they’re as useful as they are artful. And while I almost always argue in favor of having a fleet cheaper specialized cars rather than a single expensive one that tries to do everything, the E63 S Wagon is so freaking good at all things that it becomes its own kind of novelty. And yeah, it’s fast as hell. On a short tour of Mulholland Drive, my colleague and fellow car reviewer Kristen Lee leaned into the gas just enough to induce goosebumps and made my boss Mike Ballaban scream. Out in the desert days later, I got to conduct a slightly more through test of the vehicle’s abilities. Turns out Race Start and Drift Mode are just a small slice of what makes this car so much fun to use. The E-Class is Mercedes-Benz’s mid-sized luxury car. The AMG version gets stiffer seats, suspension and a nuclear reactor for an engine. I’ve been describing it as a distinctly German execution of a modern muscle car. Comfort, loads of power and a galactic-sized footprint. Plus an impressive array of high-tech tools to make all that energy easy to wield. The wagon is the same car, just a version you can easily sleep in. The “S,” as in E63 S, stands for “Sales,” as in Mercedes-Benz would like to make more of them. (Hat tip to Kristen for that one). Actually, it seems that all top-tier AMGs (right now the “63”s) are AMG “S” cars and the light beer ones (“43”s) don’t get the extra letter. Whatever. A few readers have asked if this car feels “more like a large sports car or a fast luxury car” and after putting over 500 miles on it, I can safely say it’s the latter for sure. But the vehicle’s ability to seamlessly slip between personalities is remarkable and the fact that it’s able to achieve such extremes without skipping a beat is what makes it truly amazing. The 2018 Mercedes-AMG E63S Wagon is a 197.1-inch family hauler with a 4.0-liter biturbo V8 engine chortling air and gasoline to make a claimed 603 HP and 627 lb-ft of torque, not to mention a ghastly-good exhaust note. The power is eventually fed to an advanced overridable all-wheel drive system which flings the sleek-looking land whale around corners and into the holeshot at any intersection. The exhaust music can be magnified with the push of a button. The car’s nine-speed automatic transmission can be manually shifted with paddles as you snap your way to a top speed of 180 mph, and if you’re so inclined, about 64 cubic feet of cargo can join you on that pants-soiling trip to Autobahn velocity. If it’s empty, the AMG Wagon weighs 4,669 pounds and the EPA’s comically optimistic combined-driving fuel economy claim is 18 mpg. Check out the official Mercedes-AMG spec sheets if you’d like to go deeper. If you have to ask why a station wagon with Thor’s hammer under the hood and a thunderclap to match coming out of its exhaust pipes is great, I’m not sure how you found your way to Jalopnik. That said–the AMG Wagon is more than an ironically vulgar display of power. In fact, it’s pretty low key looking as far as expensive performance cars go and damn comfortable for low-speed cruising. In Comfort mode, the exhaust is reserved and throttle response is extremely gentle. The power is palpable, but muted. Like riding a grizzly bear that’s well fed with a quiver of tranquilizer darts piercing its fur. Sport wakes the car up just a little bit; it feels more like a high-powered car is supposed to. Sport + makes the car a little meaner on rough roads but a lot more precise through sharp corners. Race mode jolts that bear I mentioned to life and opens its cage. Run Race mode with traction control off and Drift Mode activated and you might as well be wearing a meat suit while tangling with a hungry predator. The AMG Wagon is supposed to be able to return 22 mpg in highway driving, but after a week of living with (and in) this car I have to say my average didn’t come close. Even with most of my mileage on long-straight shots across the Mojave desert. It may be physically possible for this car to do better than 20 mpg, but I’m sorry to say I do not have the discipline to let it do so and I doubt anybody buying this would either. If you do buy one—which I want to recommend because the car’s so sweet—you’re also going to have to brace yourself for some significant depreciation. All new cars lose value once they leave their dealership, but AMG Benzes feel this effect with particular strength. The Wagon’s rarity might save that somewhat, though. For people who do want an AMG wagon, there really is no true substitute for sale here in America. But if you’re buying used, consider all of this a blessing. As I already alluded to, Comfort mode is almost too lethargic. You really have to goose the gas pedal to make the car move, and the steering’s far too light to feel like you’re driving anything other than a video game car. Sport mode is snappy without feeling dangerous, and the AMG Wagon is OK at absorbing smallish potholes without breaking your back. In other words: it’s alright in Los Angeles, fine in the country, would be rough in New York City and completely non-viable in Detroit. The cargo area swallowing up heaps of whatever was excellent, as was the customizable interior display and mood lighting. The optional AMG Performance seats, however, are pretty extreme for daily driving. My fiancée couldn’t figure out how to fit in the front right seat without her arms being forced out and I have to admit mine felt pretty stiff around town too. But when you start to cut the car loose, the car’s tight grip around your body starts to pay off. Let’s start like you’re supposed to—in Race mode, with the brake and gas pedals floored. “RACE START READY” the dashboard will inform you, “RELEASE BRAKE PEDAL.” What it fails to mention is that by doing so you’ll also be releasing a world of pain upon your insides, and enough g-forces to hurl everything in the leviathan car that isn’t bolted down toward its large rear window. The elevated idle-burble crescendos to a wail as rapidly as the car warps to highway speed and beyond. It’s pretty exciting, but you’ll have to reel the vehicle back in pretty soon assuming you want to avoid death or arrest. The 15.4-inch brakes are up to the task. That said, I hope it’s not too self-incriminating to add that after a few hours of hard canyon driving I felt that the AMG’s stopping power diminished somewhat and pedal effort increased. It wasn’t enough to let me down, but a competitive driver might have some trouble keeping the car in service on an actual race track. But while you’re playing around at mostly reasonable speeds on empty roads, the AMG Wagon’s senses and abilities remain remarkably sharp long after you get bored of driving. The Mercedes’ AMG Performance 4Matic+ all-wheel drive system seamlessly transitions between rear-wheel drive and all-wheel drive to maximize traction no matter what you’re up to. Unless you tell it not to. Drift Mode, activated by going into Race mode, turning traction control off and pulling back both paddle shifters, locks the car in rear-wheel drive and basically turns it into an old-school animal with airbags. It would be unsafe and antisocial to try and actually drift a borrowed six-figure car on public roads, so I didn’t, but I had to find out how easily the tail could be stepped-out for science. Let me make it known: in Drift Mode, you’re just a twitch on the gas pedal away from going sideways and much more than that could turn your Cars & Coffee exit into a YouTube sensation in short order. In a bad way. 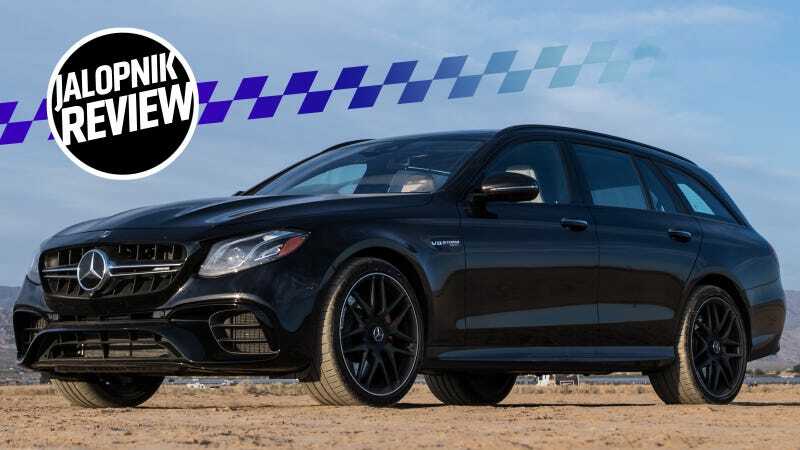 You’d really have to be on a race track to comfortably enjoy the full extent of AMG wagon’s abilities, but the car’s combination of power and technology makes it extremely easy to have a hell of a lot of fun wherever and whenever you want. 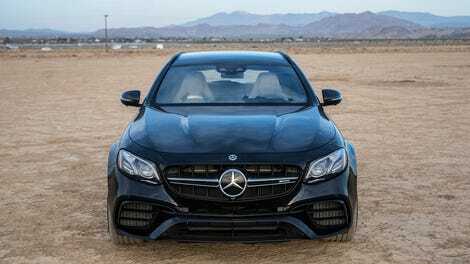 The 2018 Mercedes-AMG E63 S starts at $106,950 plus dealer fees but our test car was optioned to just north of $130,000 with carbon fiber accents, beautiful multi-spoke wheels and other toys. This is the part where I say I can’t imagine spending more than $10,000 on a car, so this one’s a little tough to wrap my head around. But if you are in six-figure status you get a pretty inarguably awesome package here. The AMG Wagon is crazy-fast, comfortable, noisy when you want it to be and elegant always. It’s also just cool, due in large part to the fact that its kind are rare to see. Screw it, if I had this kind of money, I can’t imagine what other single new car I’d rather have. As I’m sure you’ve gathered from this slobbery story, the E63 SWagon is a car that’s freaking fantastic at a great many things. But what really makes this vehicle stand out to me is the fact that it’s anachronistic and futuristic at the same time. It’s got the body of a beautiful, practical and comfortable spaceship machine with the heart of an unhinged muscle car while commanding respect from pretty much every subset of car enthusiasts. And even while wagons are making a bit of a comeback right now, they are still pretty rare in the modern American landscape, a throwback to a time before SUVs and crossovers and even minivans dominated everything. It’s hard to say that expensive performance cars ever really make practical sense, but if you can afford an AMG Wagon, I don’t think it makes much sense not to buy one.